Cheeky Monkeys is a fun game where there s no hanging around as you battle to collect the most bananas but watch out for other players trying to steal them! Designed for children aged 4-8, this game of chance encourages children to think strategically and make decisions. On every turn, players must choose whether to play it safe after their first turn or spin the spinner to either collect or risk losing more bananas! The innovative design of the 3D tree and hanging monkeys adds another fun dimension to the game! Designed for 2-4 players, this exciting game is fun and appealing for all the family. 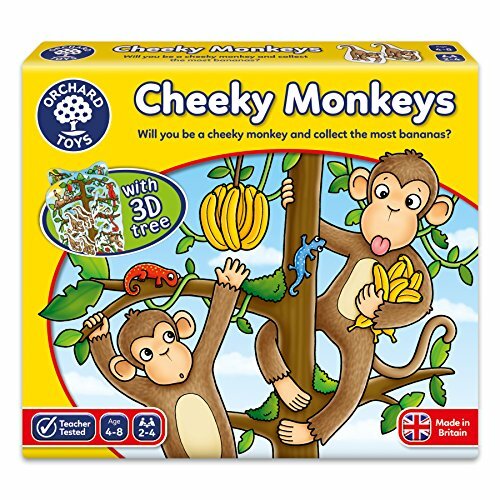 In January 2017, Cheeky Monkeys joined the ranks of Orchard Toys' award-winning games, winning a Best New Toy award at the London Toy Fair in the 'Games' category.